The Charles Baber Cemetery, incorporated in October 2010, as the Charles Baber Cemetery Preservation Trust, Pottsville, Pennsylvania (a non-profit organization), is situated on 25 acres of land in the heart of Pottsville. Fronting Market Street with its long stone wall lined with European Hornbeam trees on the street side and London Planetrees and Pine Oaks on the inside, it is rectangular in shape with its length stretching from 12th Street to 16th Street. Its massive Egyptian Revival gateway entrance welcomes visitors at 1400 W. Market Street. A second entrance, lined with pin oaks and ‘red sunset’ red maple trees, greets visitors at 16th Street and West End Avenue. 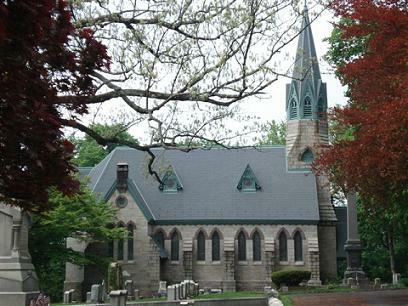 If entering from the main entrance on Market Street, a visitor is introduced to a stately grey stone Gothic chapel set among white oaks and Norway maples. The chapel, called the Chapel of the Resurrection, offers Sunday morning church services during the summer months, and year around use of the chapel for funerals and other occasions like weddings. The 16th Street and West End Ave. entrance is quieter in introduction, providing tree lined roads leading to a carriage house, a mediation area, a pond, and the upper and lower levels of the cemetery. The Baber cemetery plays a unique but intricate role in the community. It is a cemetery within the setting of a garden park. 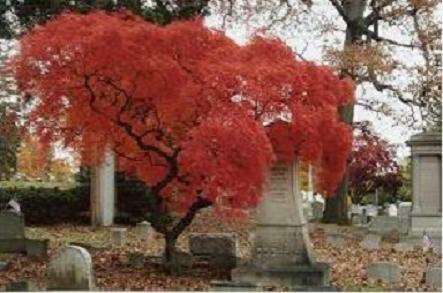 As a cemetery it offers a “union with nature” through its in-ground burial plots shaded and sheltered with an amazing variety of trees and shrubs. The burial plots have no restrictions on the size, shape, and style of the memorial markers as long as they remain within the plot boundary. The design is a matter of ethnic, religious, and personal preference. This freedom in the selection of the memorial markers, provides an extensive display of architectural design dating back several centuries. For anyone choosing cremation, the Charles Baber Cemetery has twobronze columbarium of cremation niches, situated to the right and left entrance of the Gothic Chapel of the Resurrection. The bronze columbarium is surrounded by a natural setting of flowers, shrubs and trees. As a garden park, the cemetery has much to offer the visitor: a variety of trees and shrubs providing homes to many birds, paved and grassy walking paths, lush green grass, a meditation area aside a small spring fed pond with vegetation for the multicolored butterflies and humming birds in the summer months, a Gothic Chapel, an Egyptian Revival style gateway entrance, a carriage house, and a long, tree lined stone wall running the length of its property along Market Street. The garden park offers a pageantry of colors that awaken the senses to the beauty of nature as it changes through the seasons of the glittering snow white of winter, to the yellowish green, pink, purple, and white flowering and blooming buds and leaves of spring, to the shimmering and shaded green of summer, to the reds, oranges, rusts, and golds of autumn. Whether as a cemetery or as a garden park, the Charles Baber Cemetery has much to offer the visitor.